Population growth coupled with the huge increase in urbanization and growing middle classes in developing countries result in increasing demands on energy and water resources. Pumps contribute to about 10% of electrical power consumption worldwide. Based on some estimates 90% of pumps, currently in production, work inefficiently. In recent years emission legislation first in Europe (Ecodesign directive) and more recently by the Department of Energy in the US have tried to deal with this issue by removing the least efficient pumps from production. Both of these regulations focus on efficiency over the wide operating range and not just at the design point. For example, if you take the efficiency curve for a pump in the new regulations for Ecodesign, you would create a small improvement at the design point but flatten the efficiency contours. This will produce a considerable improvement in your off-design performance and overall Eco-design rating. Improving off-design performance and ‘flattening' the efficiency envelope is a difficult task even for experienced pump designers. To improve the design–manually, requires producing many iterations via trial and error to try to find how you can improve the performance across the operating range. 3D inverse design method, TURBOdesign1, in which the pump blade geometry is computed for a specified distribution of blade loading ( and hence the 3D pressure field) enables designers to explore a wide design space as opposed to conventional design methods which rely on trial and error iteration of the blade geometry. Furthermore, optimum blade loading has been shown to have generality. For example, a type of blade loading that results in a flatter efficiency curve for one configuration can be similarly effective on a pump with a different diameter or flow rate. There are also major advantages in using an inverse design based automatic optimization strategy, in which the blade geometry is parametrized through the blade loading and not the blade geometry as in conventional design (see ADT white paper). In summary, this can result in a significantly smaller number of design parameters to cover the same design space and the ability to ensure all designs meet the required Euler head at the correct flow rate. These advantages enable high accuracy surrogate models with a very small number of geometries in the design table (see ADT White paper). If one could streamline the evaluation of the pump efficiency at different operating points by CFD one could then use this inverse design based optimization strategy to rapidly develop design know-how that could enable the pump manufacturers to rapidly update their pump efficiency to meet the required targets for Ecodesign or the US DOE pump efficiency. The integration of TURBOdesign1 inside ANSYS workbench enables direct coupling between TURBOdesign1, meshing by ANSYS Turbogrid and flow analysis by CFX/Fluent for high fidelity CFD analysis at multiple operating points. ADT’s TURBOdesign WB module helps to automatically set up all the connections between the different modules and ensures seamless data exchange between TURBOdesign1 to Turbogrid and from Turbogrid to CFX and automatic evaluation of performance parameters in CFX post which are then passed on to TURBOdesign Optima or ANSYS Design Explorer (DX) for automatic optimization. Both TURBOdesign Optima or ANSYS DX can then be used either for direct optimization or surrogate based optimization strategies. 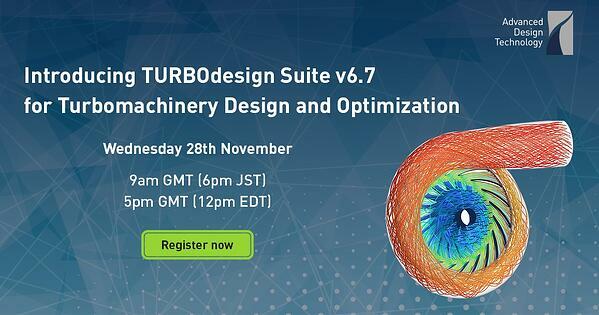 In the joint ADT/ANSYS webinar on 24th of October, we will show how the coupled solution between ADT’s TURBOdesign1 and ANSYS Workbench can be set up and a major pump manufacturer Franklin Electric will present how by using the coupled solution between ADT’s TURBOdesign1 and ANSYS Workbench they have been able to achieve designs with better cavitation performance and significantly higher efficiency.